Let’s start with Adam! Adam has been with us since before Dr. Reed and her husband opened the office. He was an integral part of our initial frame selections, setting up our Electronic Health Records, helping with the physical setting up the frame boards, and much more behind the scenes in getting our doors open in September 2016. We have enjoyed having Adam as part of the ModernEyes family and look forward to many years moving forward with him. Adam was born and raised in Omaha and took many business courses with emphasis on entrepreneurship at the University of Nebraska-Omaha campus. He has been in the optical industry since 2004. While in high school, Adam was working in a retail store and was approached by the manager of the optical department for an internship. During his time in the optical, he began to really appreciate the work, particularly the more technical aspects of lens fabrication. It was rewarding to him to take a patient’s prescription and creating something not just that he/she could see with, but to also improve his/her daily life in all aspects. A: I enjoy fabricating eyewear. Frame selection is only the beginning. Creating a pair of glasses that not only function well from a vision standpoint, but that look great and feel good takes skill and is an art. After selecting the frames, I enjoy helping patients determine which lens designs and options will work best for their specific visual needs. When possible, I cut the lenses myself to ensure the best, most personalized quality possible for our patients. Q: Which frame is your favorite? Favorite sunglasses? What do you love about these frames? A: I really enjoy our WileyX line. 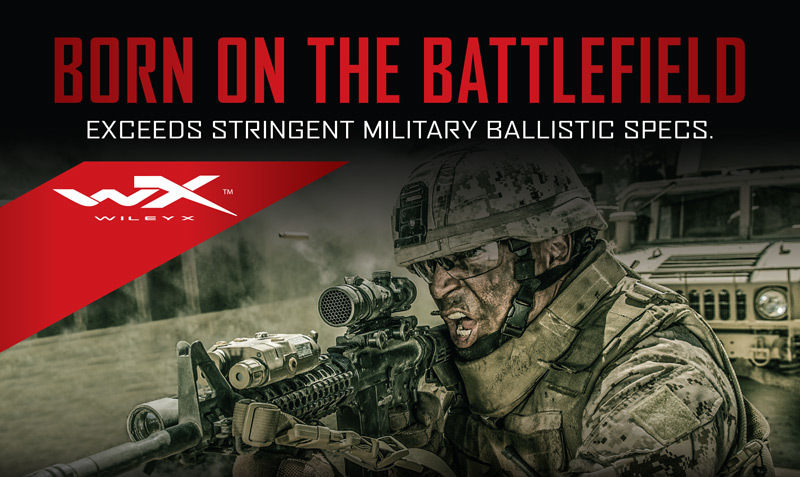 They meet all ANSI standards for safety and are used and supplied to our special forces. (Read more about ANSI standards here.) So you know they’re good. They come with removable foam gaskets that work great if you ride a bike or enjoy other activities that involve wind or need protection. They also look great. For everyday use I enjoy our OGA line. Designed and made in France they are high quality and have an edgy look. You also won’t find these in chain opticals. A: I play pool on a league for the American Pool Association, golf and love going to the firing range. I also used to shoot a lot of photography, particularly when I lived in the Kansas City area for a few years. Q: What’s your family like? A: My wife Candice and I were high school friends and after graduation our lives took us in different directions. She joined the military and I moved to Kansas City for a business venture. After 10 years of emails and phone calls we found ourselves both moving back to Omaha and we attended our high school reunion together as a couple. A short 6 months later we got married, and after a year and a half we welcomed our baby boy Gavin to the world. He is growing up way too fast! Renee joined our team in July 2018. Dr. Reed had the privilege of working with Renee back when Dr. Reed had the sublease at the Target Optical in Lincoln, Nebraska. Renee was one of the top performers and opticians at her location, and Dr. Reed was sad to see her move to the Denver, Colorado area. 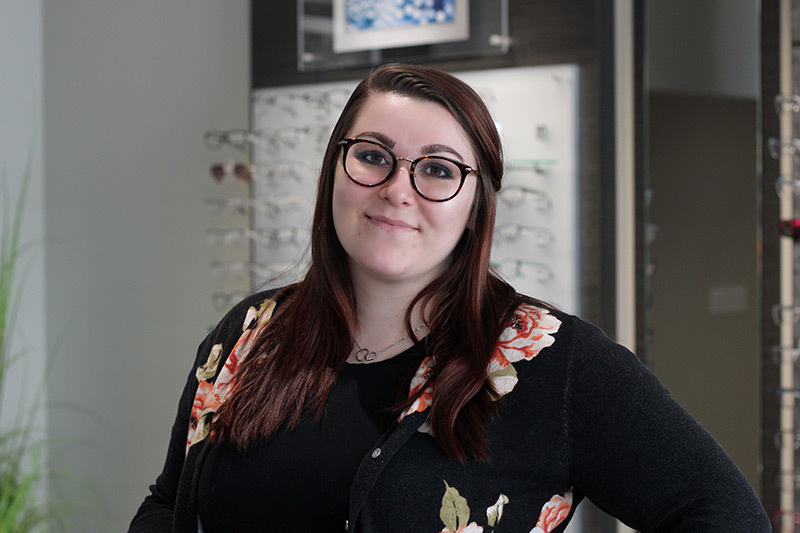 Fast-forward a few years, and Renee was moving back to Nebraska and we needed a front desk person who also had experience as an optician, so the timing couldn’t have been better! Renee claims both Denver, Colorado and McCook, Nebraska as her hometowns. She received a degree in Biology from Doane University. While she was studying at Doane, she worked part time as an optician at Target Optical. She stayed in the field because she enjoyed helping people through the eyecare process. She found fulfillment in being a person that the patient can come to with questions about all of the jargon and information the eye doctor gave him/her during the exam. Getting patients in a pair of glasses that look great but also that meets his/her specific needs is what has kept her being an optician for so long. She has been part of the optical industry as an optician, front-desk person, or doctor’s technician since 2012. R: My favorite part is seeing someone get glasses for the first time and it makes a real difference on their lives. Some people are so thankful that they now can see clearly, and it is very heartwarming. Q: Which frame in our office is your favorite? Favorite sunglasses? What do you love about these frames? R: I think my favorite is the Calvin Klein CK18704—it's from the newer selection we got from when I first started. I love how unique it is. I have a lot of out-there frames in my own selection at home, so I am drawn to ones that are a little different. It has a clear front with a black and white stripe design that rims the lenses, giving it a lot of visual interest and making the frame stand out. The simple metal temples make the frame look more sophisticated and gives a good contrast to the front of the frame. The other colors it comes in also can make the frame a less bold option, so the frame isn't only for the people wanting to make a statement with their glasses. Sunglasses in my opinion are meant to be bold and a fun accessory. 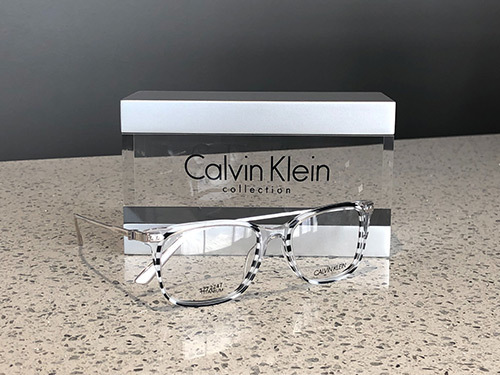 We have a Calvin Klein frame that is a cool tortoise and has a gold bar across the top. It doesn’t work for everyone, but I love it! R: I’m a voracious reader so I try and read as much as I can. I love to sing so I also go to karaoke with my friends occasionally. One of my sisters and I also do makeup in our free time to stay close to one another since she lives in Canada. R: I have 3 sisters who I am very close to and miss very much. My older sister lives in Canada so we don’t get to see her very often. My other sisters live in Colorado along with some of my other family. We are a very lively bunch; and when we get together, we are usually the loud table in the restaurant! I have some family here in Nebraska which makes being back in Nebraska easier. I go to see my mom, step dad and my Nana whenever I get the chance. 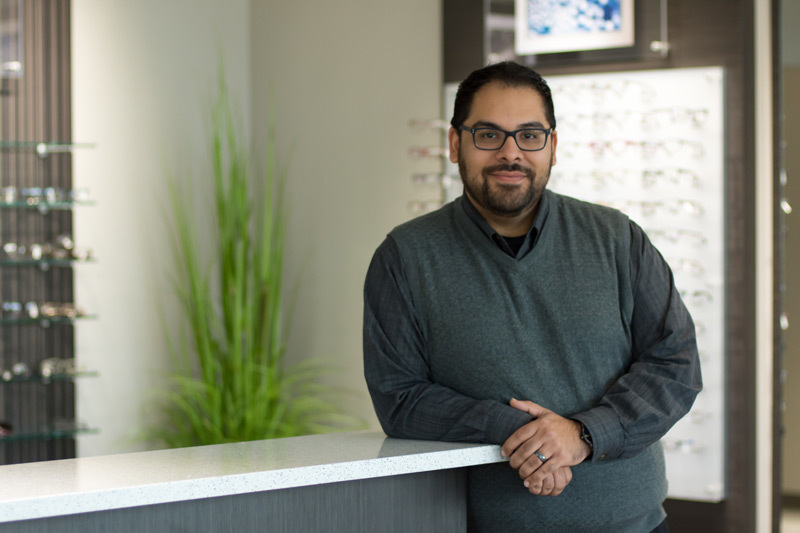 I actually started my career in the optical industry by working part-time as an optician a retail chain while in undergraduate at the University of Nebraska-Lincoln. While working as an optician, I took and passed a National Exam to become an ABO-certified optician. Many optometrists don’t have the opportunity to learn the art of frame selection, lens selection and manufacturing, and customer service because we don’t really have the opportunity to dig in and spend some time in an optical, let alone a manufacturing lab. We have classes on it, but it just isn’t the same as being in the real world doing it on a daily basis. I feel blessed to have that experience and feel it makes me a better eye doctor and business owner. I’ve walked in Renee and Adam’s shoes, and I know how valuable they are in our office and am so thankful they are part of the team. I consider them my family and can’t wait to see what our future holds together!